Bluegrass Pundit: Is President Obama a Socialist? 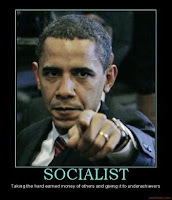 read this and connect the dots knows WITHOUT A DOUBT, obama is the VERY definition of Socialist. He is just following his mendacious nature in lying about it. God Help Us All. Obama is a COMMUNIST! It's a waste of time to use watered down terms to describe him. The visible portion of Obama's plan is only the tip of the iceberg, don't forget that the rest is there, just beneath the surface. This is well written! Thank you! Not to spoil everyone's fun but as convincing as some may take your arguments to be; they are not valid. What I mean is that you have taken the evidence too far; your conclusion does not follow from your evidence. It does not follow that because his parents, grandparents, etc had socialist leanings that he is a socialist. In fact by signing the bailout into law he proved was no socialist; he was seeking to save capitalism. "It does not follow that because his parents, grandparents, etc had socialist leanings that he is a socialist. In fact by signing the bailout into law he proved was no socialist; he was seeking to save capitalism." The bank bailout increased government control of the financial sector. How does that support capitalism? Even socialist countries have banks, they are just controlled by the government.